Joe asked his class what workers want from their local unions. This is a compilation of the list the students put up on the board after group discussions. One list was written in English, the others translated by Vinh. Much to note on this list. First, how similar it is to a list a labor ed class for workers in the US would produce. (Except for maybe the one about organizing sports.) Second, that no one seemed to have any trouble picturing the responsibilities of a local union. I will do the same exercise in my class later in the semester and then do a second level, asking them what workers would expect of a leader in a local union: If this is what a local union is supposed to do, what do the leaders have to do? (“leaders” – plural). Just out our studio door, on the far side of the fence that bounds the TDTU campus, is a four-lane divided boulevard recently planted and staked with small trees. It leads west. From the 10th floor of Building C, where the faculty lunchroom is located, we looked down and saw that this boulevard leads toward a river. Between the campus and the river are wetlands. Last night we walked down toward the river, over what I call a canal, past many young men sitting on low red stools either fishing in the currents of the wetlands or smoking, playing games, talking or drinking coffee. The boulevard dead-ended at the river, which I think is the Rach On Lon river, although since TDTU is too new to be marked on the maps, and since this district is newly rising out of soggy fields and sloughs that change their outlines seasonally, I’m not sure. But is definitely not the Saigon River, which is much, much bigger. This one is about the size of the American River near Sacramento, and very muddy and fast-flowing, as if the water is being sucked out by an ebb tide. It has boats on it, boats that are obviously old but still used for work, like transporting things from one place to another, or fishing. On the map this river is just a squiggly blue thing. We turned left and walked west along the river until we came to another dead end where three men were on guard over some incomplete construction, an excavator parked in mud. There we turned around. Although the road itself wasn’t paved yet, there were street trees planted and staked along the paved sidewalks. Two or three buildings still stood out in the area under construction: one that looked like an old house, another a corrugated metal shed. A group of men seemed to be living there. Some geese and chickens strutted around. This morning, Saturday, we’re doing various Power points, chapter summaries and blurbs for the simulations and exercises we’ll present later this semester. Vinh has to translate all this. I personally think it’s too much work for any one person, all this translation. I think we are giving her more to translate than they expected. Dean Hoa did bring a young man in to meet us last Wednesday, a guy named Mark who has just come back to Vietnam from Houston, who is bilingual and is going to try to work here. Joe gave him two chapter from the Si Kahn book to translate. But the heavy load still falls on Vinh. Joe and I are trying to use less words in our handouts. Later we’ll go out and get on the bus and see where we go. I’ll remember to bring a map. The problem of how to “teach the book” in our classes, given what these books actually say, persists. I wish it was a problem we could just face once and deal with, but every chapter presents the problem anew. My class is not so bad, although evidently it is not conventional to express criticism of a textbook here, something I consider part of trying to understand any book. But Joe’s book, Gass and Seiter’s Persuasion, explicitly says that groups lead to loss of individuality, “social loafing”, and other bad behavior, whereas the power of workers comes from numbers, which means groups. To say nothing of the whole field of sociocultural psychology, which views culture, something collectively produced, as the means by which all learning and development is created and supported, and without which we would be animals. In the afternoon, Saturday, we went into HCMC on the bus by ourselves, got off after the bridge that crosses the Saigon River, wandered along small streets where everyone seemed to be providing motor scooter repair services or else sewing out on the sidewalk, two men to a sewing machine, sitting across from each other to push giant pieces of cloth (tents, ground cloths, maybe hot air balloons or parachutes) under the needle. Is this where REI gets its tents made? 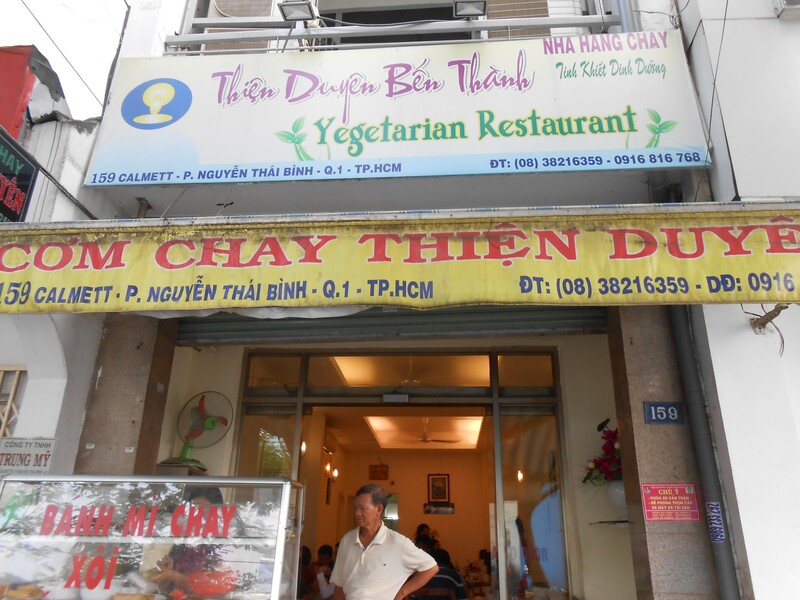 We found a little restaurant on Calmette Street that was vegan and wonderful in every way. Then we walked into District One, found the Independence or Re-Unification Palace, walked down Le Duan Boulevard to a park which seems to be a kind of playground, then turned and walked back into District 1 and had a beer in a second floor café, looking out into treetops and down into traffic as it got dark. Taxi back to TDTU for 100 000 dong or about $4.50. When I checked that exchange I noted that the dong is dropping rapidly against the dollar right now; it takes more dongs to buy a dollar. When we got back to the campus, in the dark, we heard a great noise of loudspeakers in the stadium behind our room. A crowd of students in red T-shirts with yellow stars on them was practicing spreading a huge red silk flag with a yellow star over their heads and carrying it on the run. Then in the morning, promptly at 7 am, the loudspeaker started again. Looking out our back window we saw again a crowd of students in red T-shirts being led through various formations by someone with a microphone. This went on for two hours until 9 am. I assumed this was preparation for Independence Day, September 2, Wednesday. Turns out it was not preparation; it was the event itself. We were too tired both at night and in the morning to go see what was going on. Vinh got me these photos off the TDTU website. To summarize my state of mind at this point: the original questions that troubled me, back at the very beginning of this adventure – what exactly do we have to offer these people, how can we define it clearly enough so we can deliver it effectively, and are we really the right people to be trying to do this? – is still unanswered. But the background is filling in, bit by bit. Ms. Phung Thi Thanh Nhan, Director of the Legal Advisory Centre of Hanoi VGCL, said that besides providing education on the laws and regulations to large group of workers and group consultancy, this year several resource centres will be introduced in busy business areas of the city. These centres will be equiped with computers, internet connection, office space for consultancy meetings and will open flexible time and out of normal working hours to assist workers especially migrated workers. This sounds like a workers’ center and I would very much like to see it. August 24, Joe’s birthday. Lots of good wishes. His second class went fine. 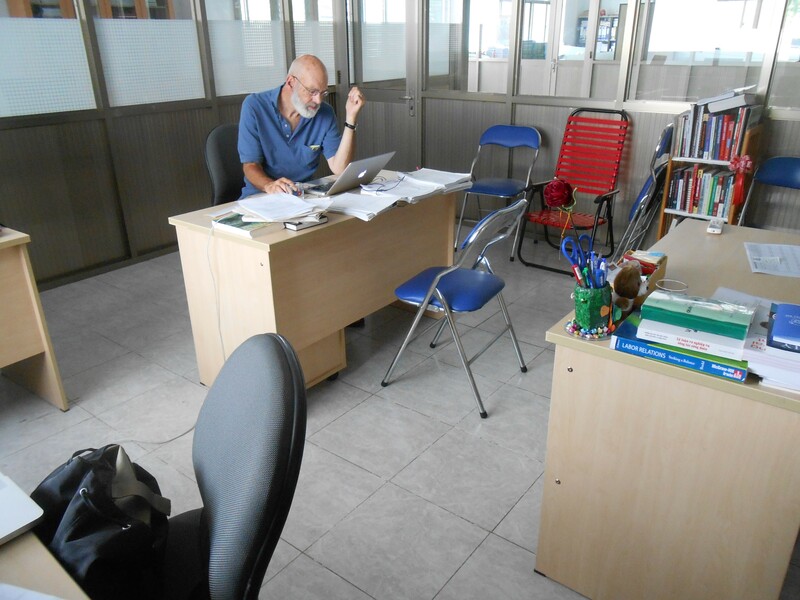 He spent a lot of time explaining our research project, which I will do in my class on Wednesday. I hope we can use the Frank Bardacke article on organizing in strawberries from the Stansbury Forum for this somehow (see previous post). Then he turned to the book he is supposed to be teaching, Gass and Seiter. He proposed a discussion question that attempted to link a concept in the book (‘gamification’) to issues that the class is supposed to be about (Community Mobilizing) and the students, as if they understood what was really important, jumped right over the Gass and Seiter connection, took the microphone and talked explicitly about how to use social media and games, in the sense of friendly competition, to reach union members. Many of the students have bought photocopied versions of the book. Good luck to them trying to read it! In a discussion with Dean Hoa about where they found the topic of “persuasion”, he said it was on the Cornell website and sure enough, there it was, a whole class on Social Persuasion in the Organizational Behavior department. Then today I was reading an email from the discussion about the fight for City College of San Francisco and they quoted the Chancellor as saying, “We lead by persuasion.” Maybe that’s who uses these concepts! I attended Joe’s first class but went back to the office during his second class. While I was there, a young woman whose name is Helen came in and asked me if I would teach another class, this one on Cross Cultural Leadership. It’s part of the Business School curriculum but they don’t have a teacher for it. It’s going to be taught in English, all the students supposedly speak English, the readings are in English, etc. They got the curriculum for it from the University of Massachusetts (I don’t know which one). They have only one of the books for it, a German book in English. Helen was persuasive to the point of being insistent. It would be taught as a 6 week class, five “sessions” – 45 minute blocks – per day. I said I’d do it if Dean Hoa gave permission, and apparently he has done so. She wants to start this Thursday. I said no way – give me at least a week to work on it! It goes without saying that this is not the way I’d normally prepare to teach a class. I’ll start with reading Stephanie Luce’s 2014 book, Labor Movements, Global Perspectives, from Policy Press. Joe just finished it. There is also one chapter I can use in Northouse about comparative leadership cultures, with lists of characteristics. I think that the main thing I have to offer in this instance is teaching experience and the English language. In Joe’s second class the students wrote “Happy Birthday” on the board and sang happy birthday to him when he came in. He was pleased and surprised. After class, Dean Hoa organized seven of us going out to dinner together. It was raining and rush hour as we walked out of the campus onto the main street and down the sidewalk. We went a few hundred yards past open shops, some little more than sheds, selling everything from mattresses to granite counter tops to motorbike repair to food. Rush hour means motorbikes driving on the sidewalk, too. We turned in at a restaurant that revealed itself to have many criss-crossing staircases and inner rooms, all old dark wood. We wound up in a private dining room on the second floor, decorated with wall paper like someone’s 19th century home. Vast amounts of food began to arrive. While we were sitting and eating I checked with Dean Hoa about this Business management class. He said it was fine; he wanted the President to know that international visitors to his faculty can benefit the whole University. A young man whose name I must learn, who is a workplace environmental health and safety lecturer, who studied in Moscow and has taught in Europe, joined us. He is also a magician. He is tall, thin and has a wildly roguish unpredictable smile. Another lecturer whom I’ve met, who is a photographer, came with us, as did Vinh. Miss La appeared soon, coming from her class, and food by now was covering the table. Heinekin beer came in a tall glass urn and our glasses were refilled constantly by a young woman wearing a tight red short-skirted uniform, one degree more provocative than an airline stewardess’s outfit. Great eating, drinking and jollity ensued, followed by exchanges of personal history, performances of magic, presents for Joe (a beautiful blue shirt!) and a chocolate cake. I was asked if I had any “skills,” anything I could contribute to the fun. This is not something I’ve ever honed up on, but I can see that I’d better develop a skill. I sang a verse of Solidarity Forever and everyone joined in. Apparently Leanna and Hollis got the whole faculty to sing it together. I can tell stories; maybe I need to learn some jokes. Or at least some more songs. Back to the university in pounding rain. They have “free pianos” scattered around the buildings. We stopped at one, I played a few phrases, then Vinh sat and played a real song, something I recognized but can’t name. It will be called Fullbright University. Harvard will not be managing it, but will be involved. This is a model of what you have to look at. We’ll see if we can get this translated to use in our classes. If you aren’t familiar with Frank Bardacke’s book, Trampling Out the Vintage, published in 2012 by Verso and winner of the UALE Best Book and the Sidney Hillman prizes, and probably others as well, try to get a copy. It’s good literature and great reading as well as powerful history of farmworker organizing. First, the Peter Northouse book, which I am using as a text and which takes as its first line, “Leadership is a highly sought-after and highly valued commodity.” He marches through ten or twelve theories or approaches to leadership. We learn about “transactional”, “authentic”, “situational,” “transformational,” “path-goal,” “member-leader exchange theory,” etc etc. He notes that several of these approaches to leadership are now available as executive training packages. You do not learn how to lead from this book. Instead, you learn about research about leadership. Northouse names researchers, lists elements of each approach, offers case studies, balances strengths and criticisms and provides a self-assessment tool at the end of each chapter. After reading this book, you are no longer a virgin with regards to leadership training packages. Compare this with Si Kahn’s book Organizing: A Guide for Grassroots Leaders, published in 1991 (revised off the 1981 edition) by the National Association of Social Workers. This is really good stuff. You could really learn something about leadership and organizing from this book. It is written like a real conversation with serious people who are asking real questions. This is the book our students need, not Northouse. But then tonight, coincidentally, Joe and I succumbed to watching Netflix, which we can do because I got one of those VPNs that make it look as if I’m logging in from Los Angeles. We watched Nightcrawler. Jake Gyllenhall figures out how to make living by photographing bloody nighttime crimes and accidents, some of which he arranges, for the TV morning news. His sociopathology is that he appears to have learned how to relate to people from an executive leadership training course, like the ones in the Northouse book. He is like an executive leadership training package gone zombie. What this tells me is that this lingo, with all its idioms and tropes, is so recognizable that it can carry the whole weight of a character in a movie. It has been so discredited that it can stand alone as a form of insanity. I don’t think the evolution of that lingo into a sign of insanity would survive translation. I think it tells us something about the US, though. Page after page of black and white images, showing people, protests, signs, newspaper articles. Seems like yesterday to me. But the people we are relating to here are of the next generation. In the stories in Kent Wong and An Le’s book, Organizing on Separate Shores (UCLA Labor Center), the connection between then and now is made explicitly. Every one of the stories about the lives of the Vietnamese-American labor organizers begins with how they were affected by the war. Even if they were born after the war, the story begins with the war and how it changed the lives of their parents. But we have not had any comparable conversations. Vinh is 26; Dean Hoa is in his forties; only Miss La is probably of our generation. So far we have learned that she worked in school, became president of her union, and then came to Ho Chi Minh City. The oldest people I see around campus are the men and women who, wearing conical bamboo hats, sweep the paths and roadways with woven straw, clean the rooms (like ours), push the green plastic garbage bins and take their lunch on the tiles of the arcade going into the soccer stadium. 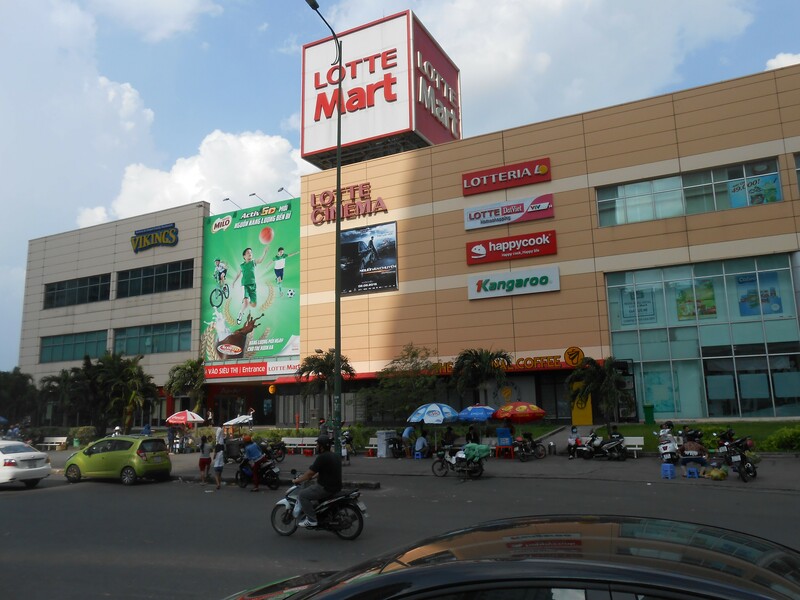 Vinh took us shopping at the Lotte Mall Friday afternoon. A dedicated bus. #86, runs from the campus northeast into downtown Ho Chi Minh City and passes the mall, which is really within walking distance if you’re up for it in the heat. The ride is 5,000 dong or about 22 cents per person. The Mall is a single two story building, sort of a Target, with a food court (we ate there), bookstore (we bought maps), movie theater showing many US and Asian action films, and a clothing, kitchen and hardware section and then downstairs a big Safeway–type grocery store. Sensory overload again. Hard to shop. I was looking for some gym pants and did buy some, for 179,000 dong or about $8. 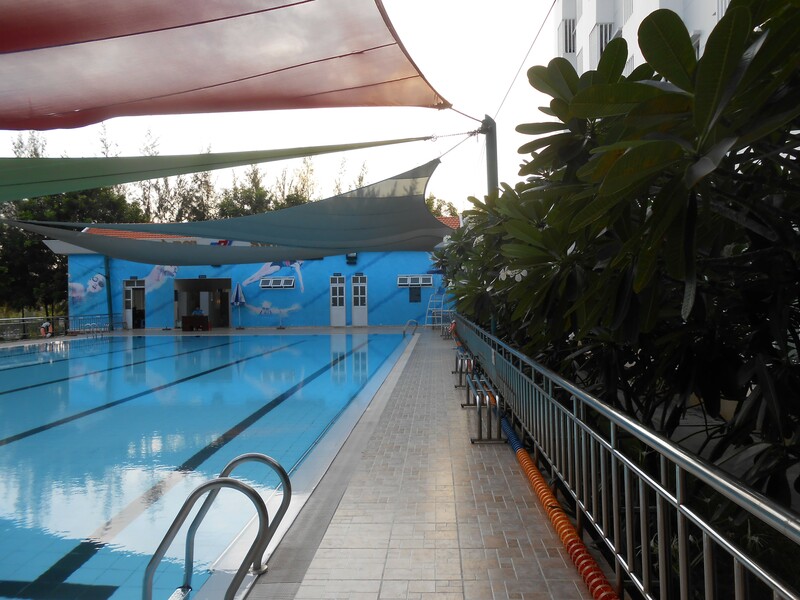 Then back on the bus, went swimming in the gorgeous pool overhung with what look like oleanders, except that the flowers are big milky white lilies. A rosy sunset helped me figure out which way was west. Back to the room, worked on Power points for next week’s classes, and collapsed. Saturday, we got up and walked all around the university exploring. There is a set of outdoor exercise stations near the canteen, overlooking the canal. North and west of the campus beyond the canal, are wetlands. In the future, that land will be developed. Around the campus we found guarded motorbike parking lots, a much larger canteen with about 100 tables, the photocopy shop and what looks like a horticulture program, packed with lush plants. We found a huge martial arts room with mats and students in white canvas outfits, and the exercise gym and yoga room, all very clean, mirrored and modern, but closed. I experimented with greeting people and can now say that a smile by itself doesn’t get you anything; you have to bow your head and nod. Back in the room we worked on our various class handouts again and emailed them to Vinh for translation. Later, three young women knocked on our door and took us, on the 86 bus, into District 1, the center of town. The young women’s names were Mai, Pi, and Tam. Pi and Tam work together at a child care center. Tam is in both Joe’s class and my class. Mai won a scholarship last summer to go study English at CSU Monterey Bay. Angie Ngoc Tran teaches there and did the interviewing for the scholarships. They are part of a group of volunteers who work with international visitors with whom they can practice their English. 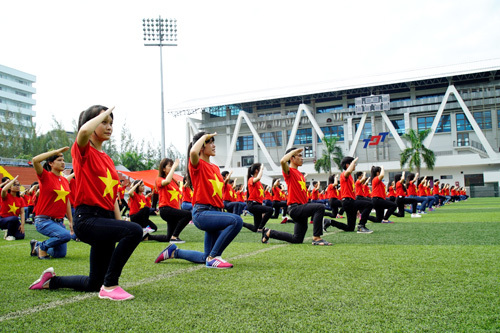 So we were guided around the highlights of old Saigon by three lively young women in the universal student outfit of tight black pants and backpacks. We went to the main bus station, to the huge indoor market (where I bought two blouses), to a bookstore and to an eating place “for students and working people” where you enter into a pillared alley, probably the back of a once-grand house, past several dozen women sitting on low stools cooking things deep pots over open fires, and find a low table to sit at. One of the managers comes and asks you what you want and you pay and then go get it. I put myself in the hands of our guides and wound up with some spicy chicken and sticky rice. A small bulldog and a kitten snuffled around under our table. Then to the Post Office, very grand and beautiful, and the Cathedral, and eventually home just in time to get into the swimming pool at sunset. Today (Sunday) Vinh called and said she and her fiancé would take us out to breakfast. Again, taxi into the center of town (about 125000 dong, or $5.50), but this time breakfast in a grand outdoor café next to the Independence Palace, built (or re-built) in the 1960s and occupied by various presidents of South Vietnam until the liberation in April 1975. After breakfast we walked through the palace, which is now an open museum where you can look into the reception halls, salons and offices. It has been kept as it was: carpets, chandeliers, gold and red furnishings, art. The private apartments of the President and his family, with dining tables all set with knives and forks and wine glasses. This is where American advisors met with Vietnamese leaders and diplomats to plan and carry out the war, and ultimately, to abandon it. I need to get the sequence of events in April 1975 right. Things move very fast. From the roof, which had originally been designed as a meditation room but then remodeled by President Thieu into a party room with a dance floor and blast-proof glass walls, you can see the helicopter which is a US made Huey that was President Thieu’s helicopter. Also marked on the roof is a circle where the NLF airforce pilot, returning from a different mission, took a chance and dropped bombs on the Presidential Palace, a few weeks before the final fall of South Vietnam. Down below, parked under the trees, you can see the two NLF tanks that broke through the wall around the palace. The young lieutenant who was driving the tank got out, walked up the steps of the palace, accepted the surrender of the government and raised the NLF flag. Maybe a little bit of legend here, but that’s the main idea. Down in the basement under the palace is a large bunker with many rooms, communications center and apartments, for the use of the President, and he did use it. Gray walls, cement, metal doors that lock. Rooms both in the bunker and up on the upper floors have floor-to-ceiling maps on which the military progress or retreat was marked. The paper is yellowed but you can still see the colors. The details appear to be hand-drawn. So Friday, Saturday and Sunday have been spent exploring the world we have entered. I am glad that we’ll be here six months. It’s too much. Old Saigon, or District 1, has big parks, roundabouts, narrow one-way streets, fancy hotels and public buildings painted bright yellow or tangerine. The street trees are taller than most city trees – they rise up to the third or fourth stories of buildings. The typical apartment building is narrow – maybe 24 feet frontage – and four or five stories tall, with commercial on the ground floor and balconies full of plants on the upper floors. Most buildings are no more than 5 stories tall. Traffic: if there are two private cars on a block, there are twenty taxis and a hundred motorbikes. It flows smoothly, slowly and steadily. There is no street parking. Motorbikes park up on the sidewalk. Crossing the street is best done in large groups; vehicles will flow around you, but sometimes very close. Traffic obeys the red lights, pretty much. Right now there are lots of red banners with yellow stars and the hammer and sickle, getting ready for Independence Day. The pollution is not too bad. Looking at the sky, it’s bluer than LA. People riding motorbikes almost all wear masks, however. They also cover up, to protect their skin from the sun. So you see women wearing long-sleeved jackets and long skirts riding on motorbikes. In the parks, group athletics, exercise and outdoor events are going on. This is a picture of Vinh taken at a different time, another time when we went to lunch with her. This is the restaurant where she and Dean Hoa took us to eat on our first day here, straight off the plane. Everything is very good and fresh. If you are getting pho, they bring you a sheaf of spicy, minty greens and you peel off the leaves and put them in your pho. Between now and May 2016, there are 30 new courses that have to be prepared. Dean Hoa, with whom we had dinner the other night at a Japanese restaurant (best fish I ever ate – grilled mackerel) says that they have the textbooks. They just now came into the library. Now they have to read them and write the syllabi. Reading them involves us, I believe, since they are all if not most in English. Vinh says that responsibility for the different courses has been spread around among the lecturers. We have both been part of designing a new curriculum before. We worked with Steven Ashby at Illinois to put together the online program. I worked with Sue Schurman and Pat Greenfield at the National Labor College when that program was just ramping up to shift to credit from non-credit. The push to lay out the courses, head to toe, and get them on the books is the same. Once you are committed to doing it, you just have to push forward systematically and not think too hard. You’re in the “Get it done” mode, not the “Isn’t this interesting?” mode. So in some ways, this is familiar. What is not familiar is the sense of expanding possibility. 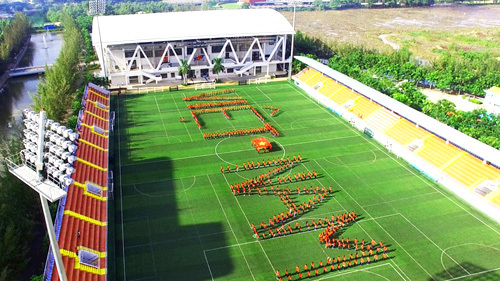 Vietnam is growing. The economy is expanding. There is solid support for this university and for this program. The crisis is not the same kind of crisis we’re used to in the US, where things are falling apart and people are afraid. Instead, it’s a crisis of managing a runaway horse, or at least one that could run away if you lost control. Joe noted that the display of wildly glamorous fashions in the breezeway on the first floor is part of an overarching plan to capture the high value part of an industry, the design end rather than just the assembly end. So much of Vietnamese manufacturing is assembly of products out of parts that are designed and made elsewhere. It’s easier to see how this works in fashion and media than it is in labor relations, but it’s the same idea. Making Ton Duc Thang one of the top 100 universities in the world and attracting international students to this labor relations program by teaching in English are ways of capturing the high value part of the higher ed industry. Things are happenings so fast that I may not be able to keep up, even though today is supposed to be an off-day. Thursday. A day when young women wear the ao dai. Many women faculty (called lecturers; here, “faculty” means department) do also, and the variations on it, mostly hand painted silk, are breathtaking. Some are painted with a single long stemmed flower, the stem on the shoulder and the petals all the way down the front to the hem. I think I would look pretty silly in one, however. We’ll see. It’s a great temptation. Some more information about how the university works. As part of the move to a market economy (I am choosing my words carefully, here), the university was granted autonomy. That means, for example, that the government (which includes and in some way also is the same as the Communist Party) no longer places people in positions or runs it in a hands-on way. Instead, the university is free to design its own programs, hire people, run its own business and there is a firewall between it and the government. However, it also has to meet specific targets. The targets that I have been told about have to do with enrollment, programs, participation in international conferences, bringing in international visitors (that includes us) publications, etc etc – all the things one associates with active university life. The catch is that along with autonomy is accountability, and the President himself is accountable for meeting the targets. He can fire people who work for him and be fired himself if the university fails to meet the targets. With regards to academic hierarchy: the English word “lecturers” is used for all faculty who teach, but they do have rank, based on degrees: MA, PhD., etc. Moving up from Assistant to Associate to Full Professor seems to be rather like our system, except that under our system, given the decline in support for public higher education since the 1970s, the preference is to hire part-time, adjunct professors and restrict the number of tenure-track and tenure positions, ultimately reducing the number of tenured faculty and creating a kind of wild west culture around actually getting the brass ring of tenure. 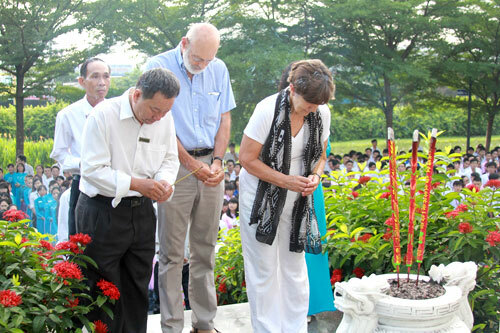 Today is the birthday of Ton Duc Thang, the founder of the university that bears his name. He was a contemporary of Ho Chi Minh and like Ho Chi Minh, he was a seaman (among many other jobs). Going to sea was one of the few ways that a Vietnamese working class person could get out of the country when it was under French colonial rule. That’s how Ho Chi Minh got out, too. Ton Duc Thang wound up in the French Navy and was on a ship that in the Black Sea when the Russian revolution started. The story goes that he was the person who climbed up the mast of the ship and hung out a black anarchist flag in solidarity with the revolution. Another story is that he was part of a plot to turn the ship itself over to the revolution. He came back, became vice president under Ho Chi Minh, then President after the death of Ho Chi Minh. He died in 1980. That means that he was president during the re-unification period when Vietnam was trying to rebuild itself from the war and simultaneously create a socialist society. It was a period of great deprivation. Many of the “boat people” who wound up in California, including the people who showed up in my community college classrooms, came during this time. I remember teaching classes with Vietnamese refugees and Vietnam war vets sitting in the same classroom. The Soviets provided some support, but the war with Cambodia (I’m a little unclear on sequence, here) sapped the country even more, and the Chinese invaded from the north. How this all got settled I don’t know. Doi Moi, the “loosening of the rules” or “breaking the fences” and opening to the market economy didn’t begin until the mid 1980s. And then, to top it off, the Soviet Union collapsed. Socialist countries like Cuba and Vietnam that had depended on Soviet support felt the bottom drop out from under them. But this morning, at 6:20 am, we were supposed to meet the rest of the Labor Relations and Trade Unions faculty in the office on the ground floor of Building B. It makes a lot of sense to have major public events at 6:30 am, due to the heat. By the time we got there, however, perhaps 2 minutes late, the others had already left but Ms. La was just arriving, and another lecturer who had been waiting for her opened the door for us. I will write more about Ms. La later. I have been told about her by many people, including Angie Ngoc Tran and everyone else. She was at one time the President of the Ho Chi Minh City Federation of Labor and she founded the Labor Relations and Trade Unions faculty here at Ton Duc Thang. She is a small woman about my age, or maybe ten years younger. Today she wore a blue ao dai. People pay very close attention to her; she makes a small gesture with a few fingers, and people step into line. “Respect” doesn’t adequately describe the way people respond to her. But it’s not fear, either. We follow her and the other lecturer out to the area at the front of the university where a huge gold bust of Ton Duc Thang stands on a pillar, surrounded by flowering bushes. Steps lead up to it. Below the pillar students and faculty were lined up five or six deep, maybe a hundred per row, women on one side and men on the other. 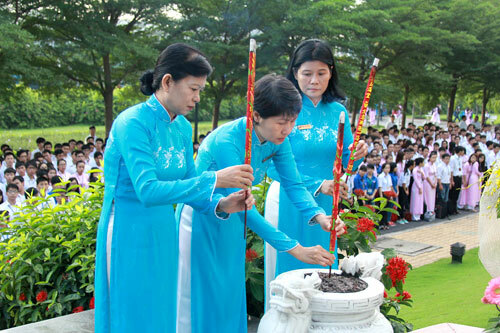 Women in their ao dai, the men in white shirts and black pants, except for Joe, who was wearing a blue shirt. There we were, next to Ms. La, which put us in the very center of the front row. Joe again was head and shoulders above everyone else. A woman spoke, a man spoke, and part of what they said was the story of Ton Duc Thang. Then six young men (including Nghia) and three young women in pink ao dai came down from behind the flowers and sang two songs. Four young women in blue and white danced a story in front of them – and in front of us – using blue scarves. One of the songs was the national anthem, fully recognizable as a national anthem because of its strong, hopeful melody and repeated assertive chorus. I am someone who enjoys singing Solidarity Forever just for the fun of it. I actually tear up singing the Internationale. A good national anthem like this has the same goose-bumps-producing effect on me even if I don’t understand a word. I got goose bumps. Vinh came forward from behind and started translating into our ears. I want to say something about the music I am hearing in Vietnam, everything from the music in the restaurant that Dean Hoa and Vinh took us to on Tuesday to the flute music that seems to float around over the canal between the classroom buildings and the soccer stadium, and the song that came before the national anthem in this ceremony. It may be my European-colonialist alter identity, from listening to too much Madame Butterfly – but it all seems to be about distance, goodbyes, large ships sailing back to a different world and leaving loved ones behind, great treasures that can never be adequately described, bittersweet melodies, etc. Vinh has Chopin on her cell phone, but the music I’m talking about is even more lush than Chopin. They are lush like the paintings of pheasants and peacocks on the walls in Chinese restaurants, or calligraphy. The images are not about Europeans exploring Asia; it’s about leaving Asia after having been there and seen wonders they can’t comprehend and will never be able to explain to people back home. Enough of that. After the dance, a man brought forward some thick sticks of incense and two men who are probably important people in the University carried them up to the pillar, bowed their heads for a moment, and then placed the incense sticks into a holder filled with rocks and sand. Ms La and another woman were next. Then it was our turn. We were given incense sticks, climbed the steps, bowed our heads (at least I did) and placed the incense. No one said what sort of prayer we were supposed to be thinking. The moment passed very quickly. I need to be more prepared for things like this. Then we walked past the pillar and down the other side. 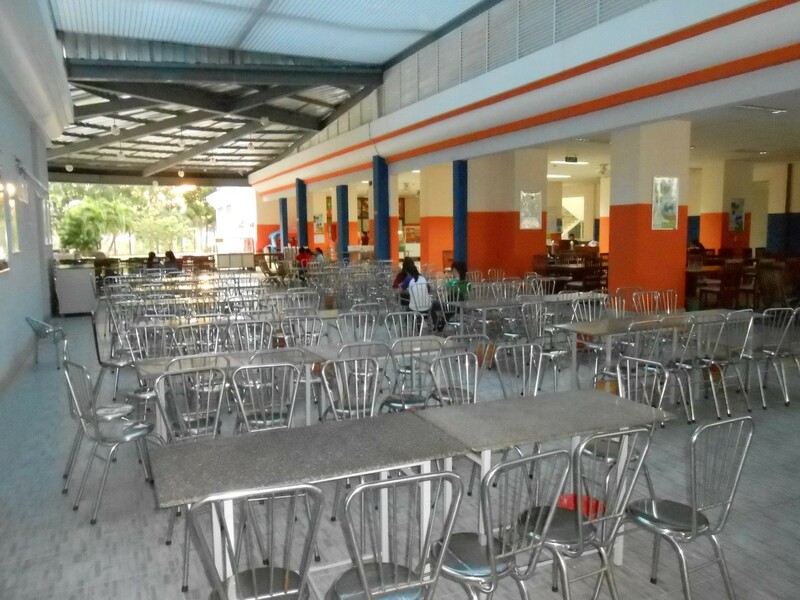 Afterwards we went and had breakfast in the student canteen in Building C and then I went back to our room, because I had to change my shirt (a brand new white T-shirt, on which I of course spilled the spicy Pho broth, which happened to be reddish like tomatoes or paprika). I have to learn to eat differently or else wear only dark patterned shirts and scarves. When I pick up the noodles in Pho with my chopsticks, they flip the broth all over my front. Stains just don’t come out of white cotton. Student canteen around the corner from our room. Sometimes, it’s full of students. I was able to get MS Office to work on my new laptop and used StrongVPN to do some house management back in CA and Vermont. Some students also sent me a fundraising flyer to correct their English for their website. They are raising money for “Jailbreak Vietnam,” a challenge to see how far into the countryside they can get hitch hiking, with no money. “Jailbreak” is actually an international youth organization with a website. The idea is to raise money for charity by traveling, in this case to support scholarships for children in primary school. I have not seen a project like this before. Hitch-hiking with no money? In addition to raising money, the goals of the project include facing fears about accidents and sexism, gaining confidence. And that was all before lunch, which gave us a choice, up in the faculty dining room on the 11th floor of Building C, of stuffed octopus, grilled fish heads, shrimp, a fish-egg meatloaf type thing in a bowl, pho and something like kim chi. An avocado smoothie for dessert. Now I need to get some work done. If nothing else happens today, that will be a good thing. But on the way back to our room about 7 pm, we saw a group of ten to fifteen young people, the girls wearing ao dais, boys in their white shirts and black trousers, doing something that looked like hip-hop line dancing under a streetlight. One of them greeted us. We are ESL magnets! And they are second year law students, hoping to graduate and become police officers (who do not wear guns, by the way, except for when protecting the President on a special day, we were told), and they are rehearsing for going camping together in Da Nang over the September 2 break. They and the rest of their group will all go together, on 100 motorbikes. Presumably, when they get there, these aspiring cops will all do a lot of dancing. I think this is a question that will play out in the years to come and there are, as the Vietnamese say, both opportunities and challenges ahead. While many of my friends in Vietnam, who fought during the war, were imprisoned in the tiger cages and made unimaginable sacrifices, miss the community solidarity of those years, not one would like to go back to that level of poverty and hunger. People in Vietnam have a lot of agency – they are generally free to protest, strike, say what they want, etc. as long as it doesn’t threaten the revolution or is not financed/supported by right wing forces from abroad. I can’t adequately report this experience by myself, by saying only what I see. So I’m grateful when others who have knowledge and experience speak up and help make the story more complete.